John Singletary of Vineland was elected chairman of the Colorado Parks and Wildlife Commission during the new commission’s first order of business at its monthly meeting on July 12 in Sterling, the agency announced in a news release. Commissioner Bill Kane of Basalt was elected vice chairman of the 11-member board, which was appointed by Gov. John Hickenlooper on July 9, and Mark Smith of Center was elected secretary. All three men served on the previous commission, according to the release. Mike King, executive director of the Department of Natural Resources, welcomed the commissioners and challenged them to help Colorado Parks and Wildlife chart a new course for the agency, according to the release. Singletary said the commission embraced the challenge and applauded the progress made by agency staff in the past year. “We’re starting a new day today because of the dedication and commitment of both of the staffs of Parks and Wildlife,” he said in the release. During the commission’s Friday session, commissioners approved season dates for small game, furbearers and migratory birds for 2012-2013, the release stated. 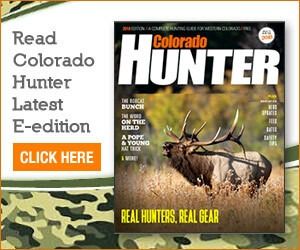 In Colorado, pheasant and other upland birds such as grouse, quail and chukar are considered small game. Migratory birds include ducks, geese and other waterfowl. For the 2012-2013 calendar, Nov. 10 will mark the statewide pheasant opener. East of I-25, the season closes on Jan 31. West of I-25, the season closes Jan. 6, according to the release. The season for dusky grouse runs from Sept. 1 through Nov. 18. The chukar partridge season runs from Sept. 1 through Nov. 30, the release stated. Season dates for quail, squirrel, rabbits and other small game were also established. A complete listing of season dates will be available in Colorado Parks and Wildlife’s Small Game Brochure, due to be available by August 1, according to CPW. In other action, the commission approved season dates for migratory waterfowl for the 2012-2013 season. In the Central Flyway Northeast Zone east of I-25 and north of I-70, the first duck season runs through Oct. 6 through Nov. 26. The second northeastern duck season opens Dec. 15 and closes on Jan. 27, according to the release. South of I-70 in the Southeast Zone, the season runs from Oct. 24 through Jan. 27. In the Mountain-Foothills Zone, the first season is Sept. 29 to Nov. 25, while the second split is Dec. 21 to Jan 27, the release stated. In the Pacific Flyway of western Colorado, the first split is Sept. 22 to Oct. 10, while the second split is Nov. 3 to Jan. 27. Similar zones and season splits were also established for geese, according to the release. A complete listing of season dates, bag limits and other regulations will be published in Colorado Parks and Wildlife’s Waterfowl Brochure, due to be available by Sept. 1, according to CPW. Commissioners also approved the development of a pilot novice upland bird hunter’s program to help recruit new hunters to the sport, starting in 2013, the release stated. Northeast Regional Manager Steve Yamashita said in the release that under the proposal, the agency would create a Northeast Region Upland Bird School at a portion of the Wellington State Wildlife Area north of Fort Collins. Agency staff would work with outside sportsmen’s groups to create a course curriculum that provides basic and advanced instruction in shooting skills, hunting techniques and field safety. An equally important goal, he said, is to help novice hunters connect with both experienced hunters and other novices for support and encouragement. In addition, Parks and Wildlife will explore creating a special set of Walk-In Access pheasant-hunting properties open only to students who had completed the training course and one accompanying mentor, according to the release. Yamashita said that the agency will evaluate the program’s effectiveness by comparing the students’ future hunting license-buying activity to other recent hunter education graduates who have not taken the course, the release stated. The commission also approved a regulation change that allows the manager of Golden Gate Canyon State Park to establish special food storage requirements to reduce wildlife conflicts. A similar regulation is in place for Mueller and Cheyenne Mountain state parks, according to the release. A second change to Golden Gate State Park regulations will prohibit hunting in the 160-acre Vigil Ranch parcel and along Gilpin County Road 2 and also require hunters to check in and check out when hunting in the park, the release stated. Commissioners also received a briefing on the draft management plan for Cheyenne Mountain State Park in Colorado Springs. Located in the transition zone between the Great Plains and the Rocky Mountains, the 2,701-acre park runs from grasslands to the 9,565-foot peak of Cheyenne Mountain, according to the release. Potential park enhancements would include development of a trail to the mountaintop, establishment of a 3-D archery course, fuels mitigation in forested areas and construction of four or five camper cabins, the release stated. An open house on the management plan is scheduled for July 25 at the Crowne Plaza Hotel on South Circle Drive in Colorado Springs. For more information about the management plan, please see: http://www.parks.state.co.us/Parks/CheyenneMountain/ManagementPlan/Pages/ManagementPlan.aspx. Finally, commissioners approved a resolution recognizing the extraordinary contributions made to wildlife conservation in Colorado and across the country by the federal Wildlife and Sport Fish Restoration Programs. Funded by excise taxes on sporting goods, this user pay-public benefit system has contributed $13 billion to state fish and wildlife agencies, more than any other single conservation program, according the release. Colorado has received more than $340 million from the program since its inception. This year marks the 75th anniversary of the program, the release stated.